It was barely noon on Christmas day and I ransacked the house, tearing down the Christmas tree and all the decorations, trying to rid the house and my heart of every visible reminder of Christmas…my first Christmas without my mother; my first Christmas in the unwanted role as matriarch of the family. I had heard, but never previously paid close attention, to people speak of those for whom Christmas was not a joyous time of year. I couldn’t previously relate. How could it not be joyous? It was a time of family, celebration, and, of course, remembering the ultimate gift in the form of the birth of our Savior so many years ago. Yet another glimpse into the pain others experience during the holidays came several years later when for the first time in 15 years, my husband’s parents didn’t join us for their traditional three-week visit at Christmas. Stricken with Alzheimer’s, and in a memory care unit, travel was too difficult on my mother-in-law, disrupting her routine and exacerbating her confusion. Taken quite by surprise that year, I awoke before any of the other family members on Christmas morning and scrolled through social media posts, but I was sad and disheartened, absent the normal holiday cheer that always accompanied spending time with my family and celebrating our Savior’s birth. In my quiet time, I took this disconcerting feeling before the Lord and realized I was again grieving. Although not a physical death, it was a death of tradition of family time spent together, and the death of a relationship that would no longer be what it once was. 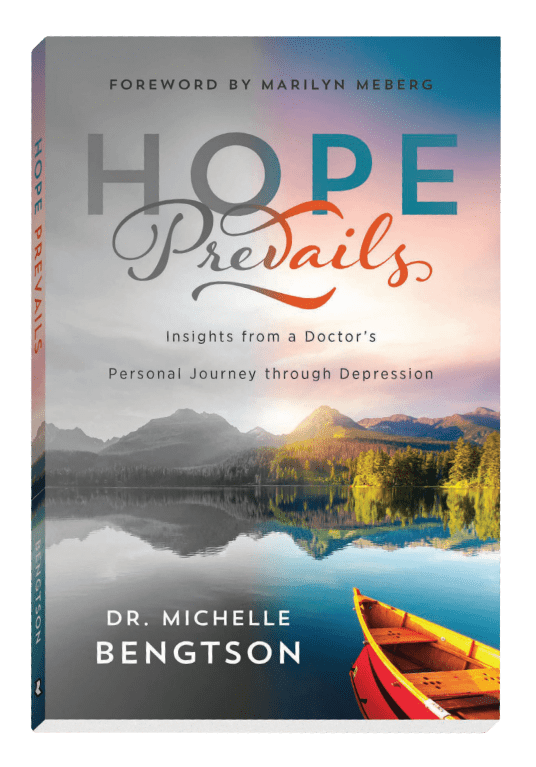 While we had our memories of years past, no new memories would be formed—a mirror of what she was encountering as a result of a wicked disease process. Those two years dramatically shifted my perspective. Ever since that first Christmas without my mother and best friend, I now look into the eyes of others and see the pain of those for whom Christmas is not the most joyous time of year. Despite the carols, and lights, and festivities galore, the holidays are for many, a difficult and painful reminder of all they have lost or lack. The parties and gift exchanges just further serve as a tool of comparison for what they cannot do or do not have. No other time of year is there such a time of concentrated comparison that serves to stir up pain and regret. As we prepare our hearts to celebrate Christmas, let us remember the reason Christ came: to share God’s love in physical form so that we might ultimately come to know Him. 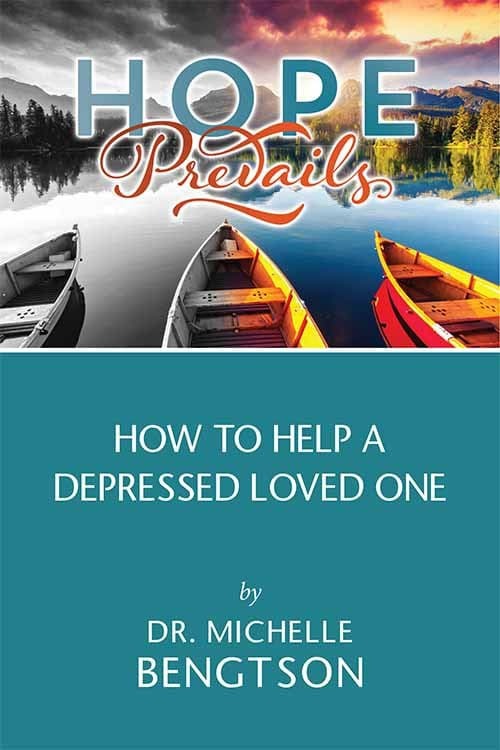 Let us be aware that many are in pain right now from the loss of friends and family members due to death, divorce, deployment, addiction, incarceration, poor health, estrangement, and poor choices. Many are dealing with a disparity between their hopes and expectations and the reality of what is. What they need from us is not an admonishment to “Cheer up,” but for us to be a light in their darkness, and love in their brokenness. Let us pray that in His faithfulness, God will be near to the brokenhearted this holiday season, and save those who are crushed in spirit (Psalm 34:18). 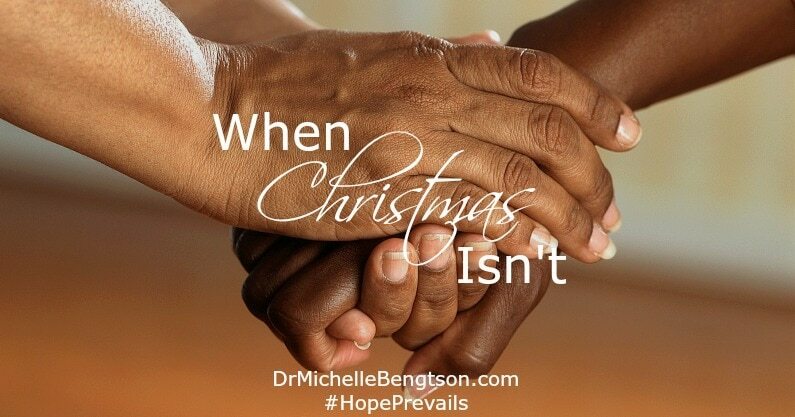 If you have been there, as I have, and know what it’s like to grieve and lack joy when it seems the rest of the world is singing Christmas carols and drinking eggnog, you have a particularly special gift to give this year. Because of your own experience, your ability to empathize with another’s suffering, you can now comfort others with the comfort you were given during your own period of pain and suffering (2 Corinthians 1:4). In doing so, maybe they will come to know Him through our love. I can hardly think of any other gift that would mean as much, can you? Christmas Special! 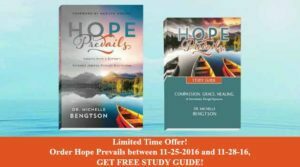 Free Study Guide and More! 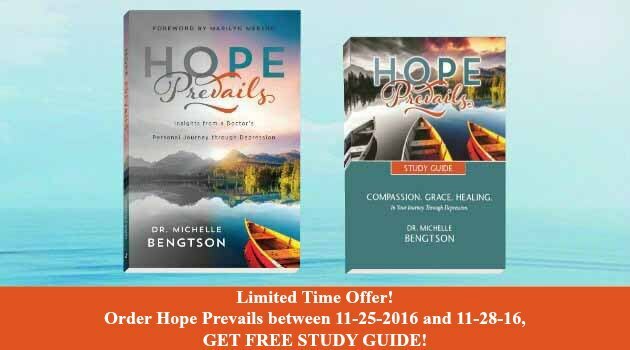 Purchase the book, “Hope Prevails: Insights From a Doctor’s Personal Journey Through Depression” today and you’ll receive the online version of the “Hope Prevails Study Guide”, as well as the ebook, “How To Help a Depressed Loved One” and “99 Truths From God’s Word to Speak Over Your Life to Combat the Lies of the Enemy”. 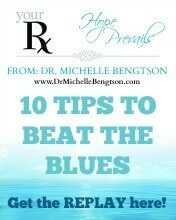 If you already have a copy of the book, purchase a copy for a friend or loved one suffering with depression. 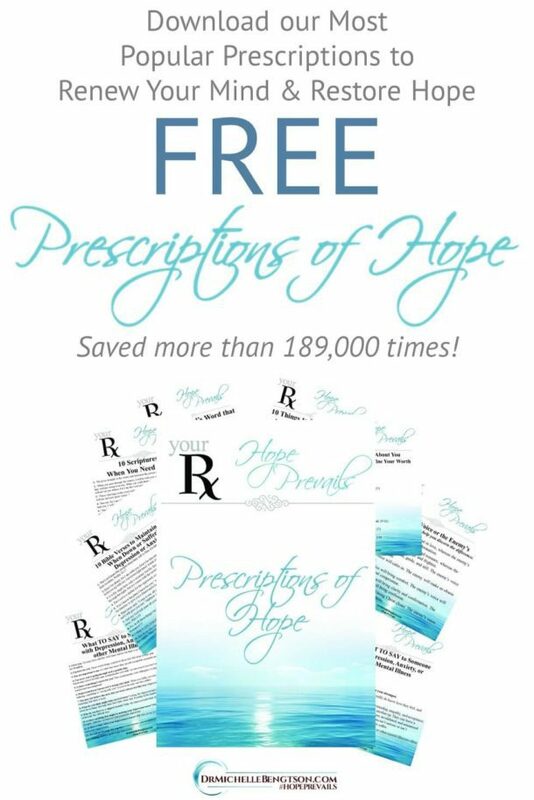 Give a gift of hope! Been there amd feeling it in a big way this year. Thank you for these words. 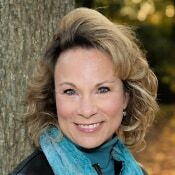 Pam, social media so often makes us feel like “everyone” else is living the picture perfect joy-filled Christmas, but so many are there in the hurt and the struggle. You are not alone. Hold fast to Him. Because of Him, #HopePrevails! Thank you for sharing this. My mother died in 2010, just days before her birthday and Christmas. Christmas was unbearable that year. Now, six years later, I still struggle with Christmas and all the other family holidays. I’m still battling the feeling that, like you said in your post, life is incomplete without her. I know she is in heaven, but the loss is so keen here. 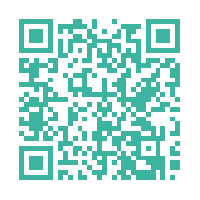 It helps to share this and read what you and others here have said. Thank you! This is such a necessary post, Michelle. 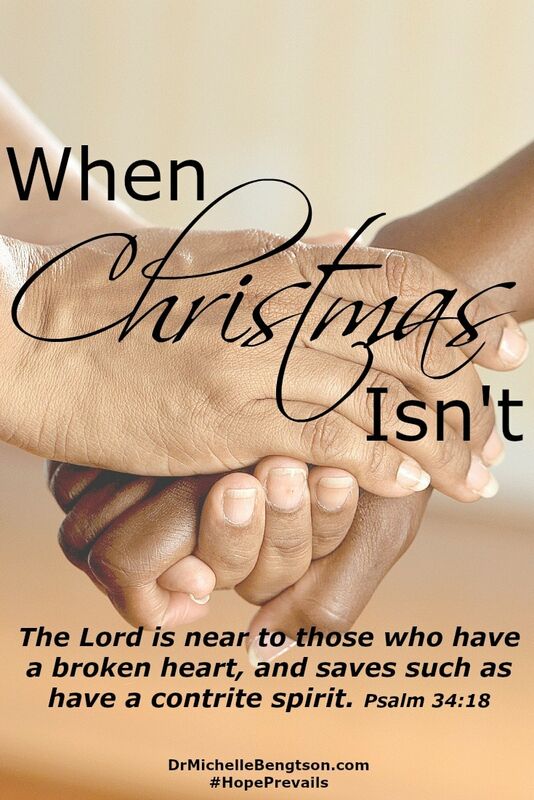 So many are grieving or are alone or are sick or so many other reasons…why Christmas just is not! Thank you for allowing others to know they are not alone. I have been in this place as my 98 year old mother was dying at Christmas and did die 1/30/2013 so Christmas was tough that year. I was a 12 year old back in 1960 when my Daddy died from Pancreatic cancer on 9/18 so Christmas was very rough that year and those memories tend to creep back in from time to time too. May your Christmas be filled with the true Joy of Christ Jesus. This is EXACTLY what is happening in our families this year. Because my mom passed away in November, all of a sudden all traditions are gone. 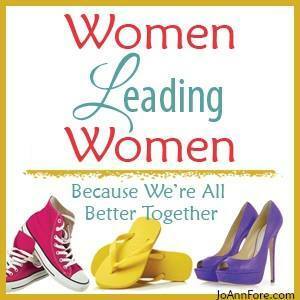 Grief is playing a huge part, but not celebrating together like we used to…is a major part of the grief. On the other side of the family, part of the family members are gone this year over Christmas. It’s just all messed up. I hate it. I want to celebrate Christ’s birth–but the way we always have. That’s not going to happen this year. One more thing to grieve…. I appreciate this post, Michelle. My dad has been gone for over 20 years, but I just lost my mom this past year. Last Christmas my husband and I spent it with his siblings in FL., so two year ago was the last Christmas with my mom. Yes, it’s hard, but I have so much to be thankful for. All 7 of my children will be here this year along with all the grandkids and I’m excited about that. God is good! Blessings to you. Hope you have a wonderful Christmas! It’s always a balancing act, isn’t it! Mourn those that are gone, but honor them. Celebrate family and carry on traditions, etc. Let’s pray for each and all!